Why aren’t all antennas omnidirectional? 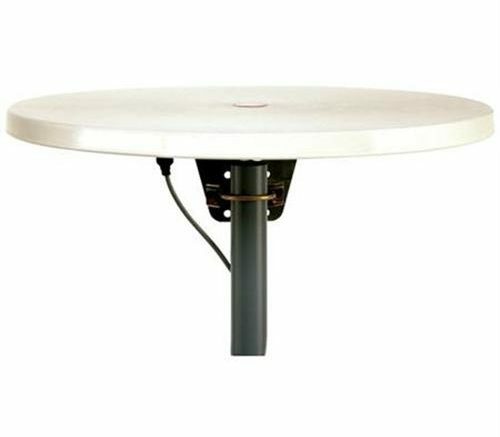 This is our Winegard Metrostar antenna. It may not be the most exciting antenna in the world, but it does a trick that most of them don’t: It pulls in signals from all direction. It’s “omnidirectional.” You don’t have to point it… just put it up there and it works. This would seem to be the easiest way to get good reception, because you don’t have to know anything about where the towers are or what’s pointing where. It certainly seems to be a lot simpler than pointing multiple antennas in multiple ways, possibly on different masts, and combining them into a single wire, and it seems a lot more reliable than using a motorized rotator to move the antenna where you need it to move. So if you’ve heard the saying “If it seems too good to be true, it probably is…” you’re on the right track. I don’t have a bad thing to say about this Metrostar antenna; if you live within 25-30 miles from the towers it’s a great option. It’s a bit more expensive than other antennas that work in the same range, but it’s well-built and reliable. But it’s not the answer to all your prayers. An omnidirectional antenna can pull in signal from every direction, but it doesn’t pull in those signals as strongly as an antenna that points in a single direction. Think of an antenna as a net — it’s out there “catching” all those radio signals. It’s not a perfect analogy but it’s good enough for now. If there’s a lot of signal coming from one direction, it makes sense to point the net in that direction rather than just let the net pick up stuff from every direction. The net is only going to be so big, and it makes sense to point it so that stuff actually flies into it. That’s the same kind of thinking with antennas. An antenna that is designed to point in one direction could easily be 10 times better at picking up signals from that direction, when you compare it to an omnidirectional one. The omnidirectional antenna is looking everywhere, while the directional antenna is laser-focused on where you tell it the signal is. Of course, the best antenna for you is the one that meets your needs. There are people who live in cities where literally the broadcasts come from totally different directions. An omni antenna is perfect for that. Once you get further out into the suburbs though, it’s going to naturally happen that your signals are going to come from only one or two directions. You’ll find more and more that a conventional, directional antenna works better there. If you don’t know where your signals come from, let our experts provide you with a free evaluation. They’ll recommend the best antenna based on the information you provide, and if that’s an omnidirectional one, they’ll choose that. More often though, the best value is a directional antenna that can pick up the weakest signals from the furthest distance. Either way… you win with free HDTV, so why not give it a try?